The Renault Duster is a force to reckon with among SUV buyers and the Maruti Ertiga has shot to the top of the charts among MPVs in July. While other segments slumped overall, especially hatchbacks and sedans due to Maruti’s troubles, the SUV and MPV segment combined grew over 17% in July compared to June. 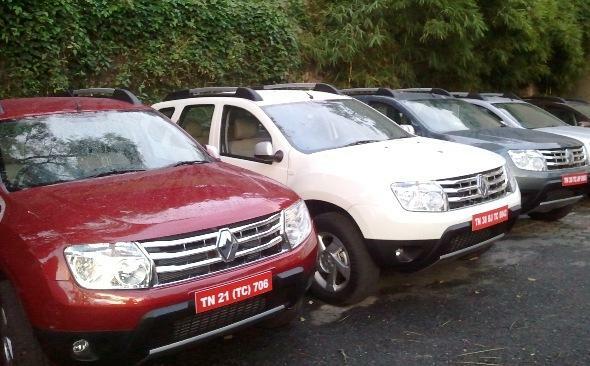 The Duster has chalked up sales of 1194 vehicles in July in the last week alone, when vehicles actually reached customers. And bookings have crossed 10,500. What makes this interesting is that the Duster has managed to overtake the Tata Safari in sales. The Safari only managed to sell 865 units in July, despite big discounts being offered on the Safari. Renault expects to make about 3,000 Dusters a month to catch up with demand. It already has a two-month waiting period. It’s interesting also to see that the arrival of the Duster has not had any effect on the Mahindra Scorpio’s sales, although it’s priced directly against it. The Scorpio sold nearly 4,400 units, an improvement of nearly 750 vehicles from June. The XUV500 is selling all it can make, with production now up to over 4000 units a month, the vehicle sold 4,007 units in July, but still commands a waiting period of up to six months with nearly 22,000 bookings outstanding. Among MPVs the performance of the Maruti Ertiga is one to look at – a silver lining in an otherwise gloomy and troubled month for Maruti. Maruti is planning to ramp up Ertiga production even further to meet pent up demand. The Ertiga sold nearly 7,100 units in July, overtaking the Toyota Innova to take top spot among MPVs. The Mahindra Xylo is struggling to overtake the Tata Sumo, which is actually picking up in sales. 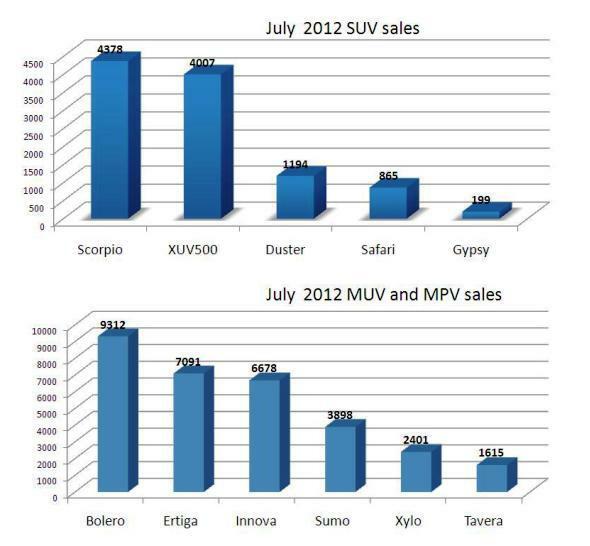 The Sumo sold its highest number this year in July at 3,900 units, while only 2400 customers bought the Xylo. The Mahindra Bolero’s sales continue unmatched – being India’s largest selling utility vehicle at over 9,300 units. Some Bolero variants in rural areas have waiting periods of up to nine months! Among premium SUVs the Toyota Fortuner has seen a consistent run this year, with sales averaging over 1270 units a month, with July seeing 1316 Fortuners being sold. 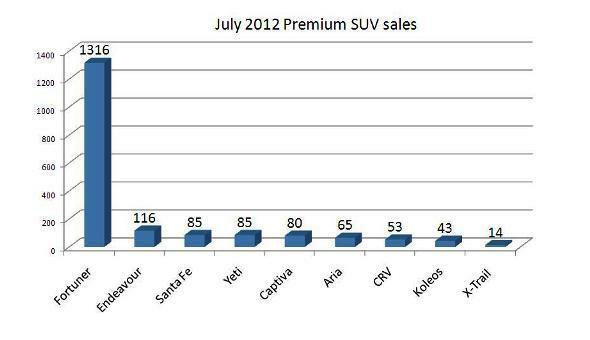 However, the other premium SUVs are just not so fortunate. Ford Endeavour’s sales have fallen further to 116 units in July – yet it remains in the number 2 spot among premium SUVs, but just look at the gap between the Fortuner and the Endeavour. The Skoda Yeti and the Hyundai Santa Fe share third spot at 85 units each! And this is after Skoda dealers announced a clearance sale on the top-end Yeti, offering nearly Rs. 2 lakh off. The Tata Aria is just not going anywhere, despite cheaper, two-wheel drive variants being available – only 65 Arias were sold in July. Next month the Tata Safari Storme is expected to stir things up a little or can it? The Nissan Evalia will also join the fray and add to MPV numbers. Do you think the Nissan Evalia will be able to repeat the Renault Duster’s feat in the MPV market? Share your thoughts.